Many patients seeking dental care have significant medical conditions that may alter both the course of their oral disease and the therapy provided. The therapeutic responsibility of the clinician includes identification of the patient's medical problems to formulate proper treatment plan. If significant findings are unveiled through medical history or clinical examination, appropriate screening tests, consultation with or referral of the patient to an appropriate physician is indicated for proper patient management. Diabetes mellitus is one of the most common chronic diseases that affects mankind and is associated with considerable morbidity and mortality. It is worldwide in distribution and the incidence is rising through-out the world. It is projected that 221 million people will have diabetes by the year 2010. In industrialized countries, a prevalence of 7% is reported, of which nearly half of the cases are undiagnosed. In other words, for every person known to have diabetes, there is someone else in whom the disease remains undiagnosed. The older age of the average periodontal patient increases the likelihood of underlying disease. Periodontitis is now considered as the sixth complication of diabetes mellitus. The epidemiological data regarding diabetes mellitus coupled with the possible two--way relationship between diabetes mellitus and periodontal disease  suggests that virtually every dentist, especially the periodontist, is likely to encounter an increasing number of undiagnosed diabetic patients. The conventional laboratory methods that are employed to detect blood glucose are time consuming and require elaborative equipment. The advent of blood glucose monitors allows the clinician to assess blood glucose at the chairside. In contrast to laboratory method, results are obtained instantaneously, which helps the clinician to make decisions immediately. Very few studies have been conducted to assess the use of this chairside device to monitor blood glucose level. Earlier reports in this regard have suggested the use of gingival crevicular blood to assess blood glucose. The present study has been conducted to evaluate the use of gingival capillary blood as a marker for blood glucose estimation using glucometer against the conventional laboratory method. The aim of the present study was to assess the efficacy of glucometer as a chairside device to evaluate the blood glucose. The objectives of the study are to:- (i) Compare gingival capillary blood glucose with finger--stick blood glucose and (ii) Compare gingival capillary blood glucose with venous blood glucose levels measured in laboratory. The study population included 130 patients who visited Department of Periodontology, Manipal College of Dental Sciences, Manipal, and comprised of age range of 26 to 78 years. The exclusion criteria were as follows: subjects (i) with history of bleeding disorders; (ii) on anti-coagulant therapy; (iii) on salicylates, acetaminophen, ascorbic acid, and other reducing substances; (iv) with conditions affecting hematocrit (e.g. :- anemia, dialysis, polycythemia, pregnancy); (v) who are systemically compromised (severe cardiovascular, hepatic, immunologic, renal, hematologic, or other organ disorders); and (vi) requiring antibiotic premedication. An informed consent was taken from the patients before starting the study. The patient's medical, past dental, and family histories were noted. The subjects were assigned to Group - A (known diabetics) OR Group - B (Patients with diabetic status unknown). Group - A included 60 subjects (14 females and 46 males, 6 Type--1 and 54 Type--2 diabetics) and Group - B had 70 subjects (27 females and 43 males). Group - B subjects were required to have a positive family history or signs and symptoms or oral changes suggestive of diabetes. Gingiva in relation to maxillary anterior teeth was chosen for sample collection, as they offer ideal access. The site with more obvious visible changes of inflammation was selected as the test site. Isolation was done with cotton rolls and salivary contamination was prevented by using gauze squares and air-drying. A topical anesthetic (10% lignocaine spray) was used in our study before sample collection, as suggested by Stein and Nebbia  to overcome pain, if any, which may interfere with adequate sample collection. Gauze squares were used to wipe off the excess spray on the sampling site. A minor prick was made in the interdental papilla with a sterile, single-use surgical lancet (MEDIpoint, Mineola, USA) to elicit free flow of blood in-to the interdental space. The glucometer is turned on by inserting the reagent strip into the test port. 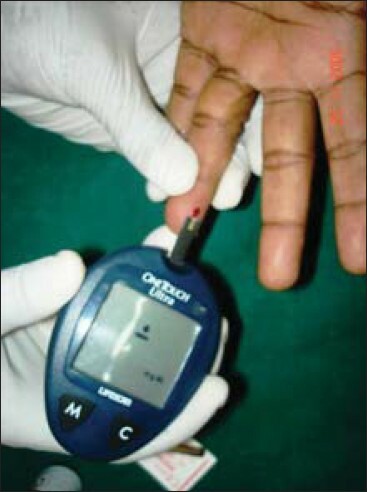 The top edge of the reagent strip of glucometer is then placed against the bleeding site [Figure 1]. The blood is automatically drawn into reaction cell of the strip by capillary action, until the conformation window is full. Caution was taken to obtain the blood sample on the reagent strip by a clean catch without contacting gingiva / teeth. The glucometer used (ONE TOUCH - ULTRA, Johnson and Johnson co.) was a second--generation meter, which works on enzyme-electrode principle. The glucose in the blood sample mixes with the enzyme glucose--oxidase on the test strip and is converted to gluconic acid and an electric charge is produced. The strengths of these currents change with the amount of glucose in the blood sample. The electrodes incorporated in the test strip measures the electrochemical charge produced and gives the digital read out after 5 seconds. The consistent performance of the meter was checked by doing a control solution test provided by the manufacturer, once a week or when new vial of test strips were opened, which-ever is earlier. The fingertip of fourth finger on the left hand was wiped with Surgical spirit (70% isopropyl alcohol) and was allowed to evaporate. The sample was drawn on the lateral surface of the fourth digit since it will have thinner epithelium and also it is a finger of lesser use. The hand is held down and the finger tip is gently massaged (but not squeezed) to obtain a round drop of blood [Figure 2]. The first drop of blood was wiped away and the second drop was used. This may reduce the risk of an inaccurate result, should the sample contain excess tissue fluid or alcohol used to clean the finger. The patient was then subjected for casual blood glucose estimation at clinical laboratory, Kasturba Hospital (located in the adjacent building), in a sample of venous blood from ante--cubital vein. The venous blood (3 ml) was centrifuged to obtain plasma. The resultant plasma is analyzed for glucose using Computerized Automated Laboratory Glucose Analyzer (HITACHI-911, JAPAN), which employs glucose oxidase method and gives the result in mg/dl. The gingival, finger--stick, and venous blood sampling took about 30 minutes to complete and they were considered to be near simultaneous measurements. The blood glucose concentrations ranged from 88-446 mg/dl. The glucose values obtained from gingival capillary blood finger-stick blood, and venous blood from laboratory method were analyzed using SPSS statistical package. 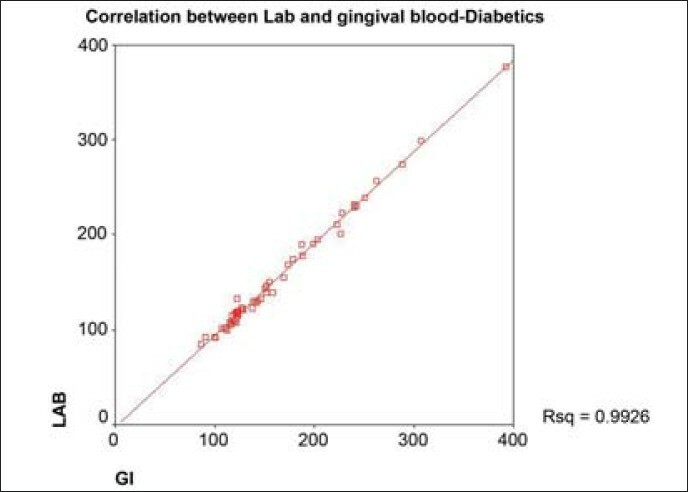 The Pearson product--moment correlation (r) between gingival and finger stick capillary blood was r = 0.996, P < 0.001 in both diabetics and controls. 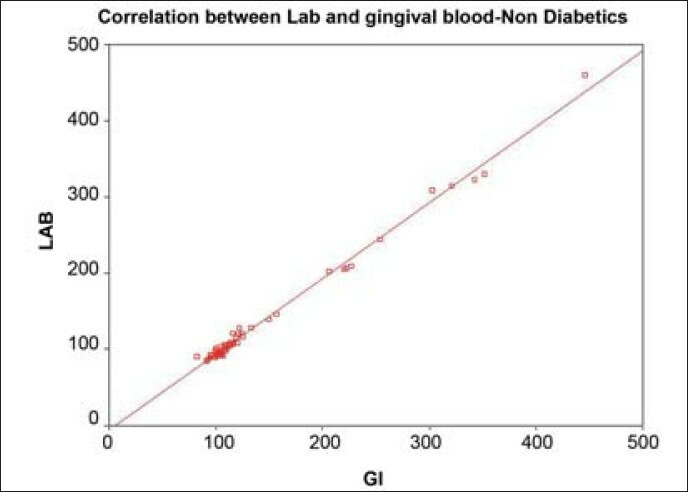 The correlation between gingival and laboratory glucose values was r = 0.994, P < 0.001 in both diabetics and controls. The correlation between finger--stick and laboratory values was r = 0.993, P < 0.001 for diabetics and r = 0.994, P < 0.001 for controls. The sensitivity and specificity of blood glucose estimation with glucometer were analyzed against laboratory method as reference. The sensitivity of testing with gingival capillary blood was 91.66% in diabetics and 90% in controls. The sensitivity was 90.0% in diabetics and controls with finger--stick method. The specificity of the test with gingival blood was 95.83% and 98.43% in diabetics and controls, respectively. The specificity with finger--stick blood was 96.66% and 98.33% in diabetics and controls, respectively. Regression analysis was calculated for the mean gingival capillary measurements vs the venous blood measurements. By using the linear regression data, the predictability of gingival capillary blood glucose measurements at a given venous blood glucose value in an individual patient can be determined [Figure 3] and [Figure 4]. In diabetics, slope = 0.996, intercept = 2.644 and in controls, slope = 0.996, intercept = 5.344. Diabetes mellitus is a common finding in the medical history of patients receiving treatment for periodontal disease. The facts that the undiag­nosed diabetics are at significantly increased risk for development of complications  and the bidirectional relationship of diabetes with periodontitis  underscores the necessity for early detection of diabetes for successful management of periodontitis in these patients. Furthermore, since both periodontitis and diabetes increase with age, periodontal therapist is more likely to encounter undiagnosed cases of diabetes and could play an important role in the diagnosis of diabetes by adopting screening techniques in suspected periodontal patients. The primary methods used to diagnose diabetes mellitus and monitor blood glucose levels have traditionally been fasting blood glucose, a combination of fasting blood glucose with a 2-hour test after glucose loading (2-hour post-prandial) and oral glucose tolerance test. These tests require fasting by the patient, tend to be highly dependent on patient compliance, and results usually will only be available at subsequent visit (second appointment). Thus, more than one appointment is usually needed to assess the glycemic status and make necessary therapeutic decisions. Also, the information from a single laboratory test may not reflect patient's current blood glucose status. Monitoring their blood glucose during the office visit may be a better alternative. It may be more convenient for the dental surgeon to obtain blood sample from the gingival site. Stein and Nebbia  were the first to describe a chair-side method of diabetic screening with gingival blood. They transferred blood onto the test strip by wiping blood directly from hemorrhagic gingival tissue. Tsutsui et al. reported the rubbing of blood onto the test strip from a blood-laden dental curette. Rubbing or direct wiping of intra-oral blood on to the test strip will not produce a uniformly timed reaction and may damage the strip's chemical indicator surface. Also, significant contamination may occur from saliva and oral debris present at the wiped gingival area or from plaque and crevicular fluid on the dental curette from its entry into the gingival sulcus. American Diabetes Association in their consensus statement on blood glucose monitoring (1987)  said that manual timing of the test strip reaction and the wiping of the test strip are significant sources of error when using glucose self monitors. To over-come these errors, Parker et al, used a glucometer, which is self-timing and requires no wiping. The use of plastic pipette is claimed to reduce contamination of the sample with saliva, plaque, and debris. Beikler et al, suggested direct use of test strip of glucometer to collect blood sample from gingiva. In contrast to Parker's study, the sampling procedure used in this study was much easier to perform and less time consuming and required no additional tools to collect gingival crevicular blood. Though high correlation between gingival and finger stick samples were reported in these studies, the contamination of the blood sample from crevicular fluid was possible and inevitable. Moreover, it has been reported that the free glucose concentration in gingival fluid was influenced by local environmental factors such as the microflora and the liberation and activation of hydrolyzing enzymes. Thus, gingival crevicular blood after probing may not represent true capillary blood glucose measurement. In our study, sample was collected from the capillaries on the outer surface of the gingiva, thus eliminating the possibility of contamination with crevicular fluid. None of the subjects under study reported pain / discomfort and no complications have been reported after sampling by this method. The correlation between gingival and finger--stick capillary blood was r = 0.996, P < 0.001 in both diabetics and controls. This is much stronger relationship than that reported by Beikler et al. r = 0.981 and Parker et al. r = 0.986 and by Tsutsui et al. r = 0.782. The correlation between gingival and laboratory glucose values was r = 0.994, P < 0.001 in both diabetics and controls. The correlation between finger--stick and laboratory values was r = 0.993, P < 0.001 for diabetics and r = 0.994, P < 0.001 for controls. These correlations were stronger than those obtained by Parker et al., r = 0.975, P < 0.0001 between gingival and laboratory and r = 0.983, P < 0.0001 between finger--stick and laboratory in diabetics. The stronger correlation obtained in the present study might be due to the elimination of sample contamination with gingival crevicular fluid. Also, improved performance of the second--generation monitors used in this study compared with first--generation monitors used in earlier studies might have been responsible for the better results. Of 70 patients in the control group, 10 were having elevated casual blood glucose levels (> 200 mg/dl) with glucometer. All 10 patients showed elevated casual plasma glucose levels by laboratory method. These patients were subjected to fasting blood glucose estimation on the next day. Of ten, eight patients had elevated laboratory plasma fasting blood glucose level. One patient had impaired fasting glucose. These patients were referred to physician and were subsequently diagnosed as diabetics. Thus, 11.42% of controls were diagnosed as diabetics. The glucometer tested is reliable for chair-side assessment of glucose with gingival capillary blood from outer surface of gingiva, as compared with laboratory method. The technique described is safe, easy to perform, repeatable, comfortable for the patient, cost effective, and might therefore help to increase the frequency of diabetes screening in dental office. The high number (11%) of detecting previously undiagnosed diabetes in periodontal patients signifies the value of having glucometer readily available in the dental clinics. 1. Amos AF, McCarty DJ, Zimmet P. The rising global burden of diabetes and its complications: Estimates and projections to the year 2000. Diabet Med 1997;14:Suppl 5:S1-85. 2. Hadden WC, Harris MI. Prevalence of diagnosed diabetes, undiagnosed diabetes, and impaired glucose tolerance in adults 20-74 years of age. Vital Health Stat 1987;237:1-55. 3. Loe H. Periodontal disease. The sixth complication of diabetes mellitus. Diabetes Care 1993;16(suppl 1):329-44. 4. Grossi SG, Genco RJ. Periodontal disease and Diabetes mellitus: A Two--way relationship. Ann Periodontol 1998;3:51. 5. Stein GM, Nebbia AA. 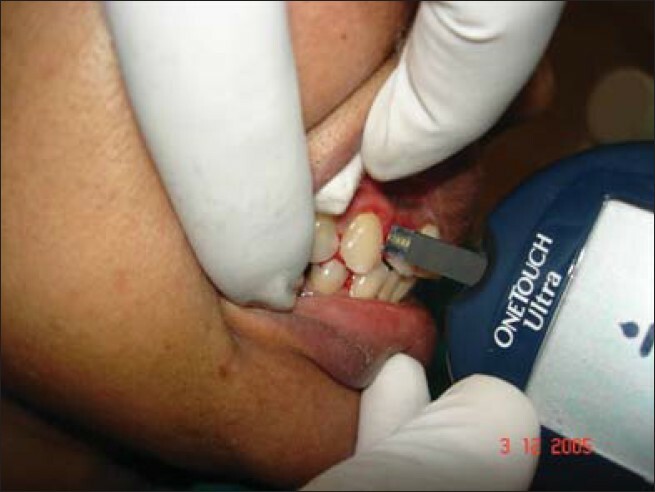 A chairside method of diabetic screening with gingival blood. Oral Surg Oral Med Oral Pathol 1969;27:607-12. 6. Rees TD, Otomo-Cargel. The Diabetic Patient. In: Wilson TG, Kornman KS, Newman MG, editors. Advances in Periodontics. Chapter 17 th , London: Quintessence publishing company; 1992. p. 278-95. 7. The DCCT Research Group. The effect of intensive treatment of diabetics on the development and progression of long-term complications in insulin--dependent diabetes mellitus. N Eng Med J 1993;329:977-86. 8. Verma S, Bhat KM. Diabetes Mellitus - A Modifier of Periodontal Disease expression. J Int Acad Periodontol 2004;6:1. 9. Fedele D, Corsi A, Noacco C, Prisco F, Squatrito S, Torre E, et al. Alternative Site Blood Glucose Testing: A Multicenter Study. Diabetes Technol Ther 2003;5:983-9. 10. Tsutsui P, Rich SK, Schonfeld SE. Reliability of intraoral blood for diabetic screening. J Oral Med 1985;40:62-6. 11. Parker RC, Rapley JW, Isley W, Spencer P, Killoy W. Gingival crevicular blood for assessment of blood glucose in diabetic patients. J Periodontol 1993;64:666-72. 12. American Diabetes Association: Consensus statement on self monitoring of blood glucose. Diabetes Care 1987;10:95-9. 13. Beikler T, Kuczek A, Petersilka G, Flemmig TF. In-dental office screening for diabetes mellitus using gingival crevicular blood. J Clin Periodont 2002;29:216-8.